A Guide for Desert and Dryland Restoration is the first comprehensive book focused on restoring arid regions, and clearly demonstrates that arid lands can be successfully rehabilitated. In addition to restorationists, the book will be an invaluable resource for anyone working in arid lands, including farmers, ranchers, gardeners, landscapers, outdoor recreation professionals, and activists. "This valuable reference will be useful for soil scientists, ecologists, biologists, conservationists, and two- and four-year college and university academicians involved with teaching and research on this topic." "David Bainbridge presents a realistic view of the ecological challenges to healing the world's deserts and drylands. Moreover, he offers innovative approaches to desert protection and restoration that can be practically implemented by those in the field." "A Guide for Desert and Dryland Restoration belongs in every manager's toolbox and on the shelf of every researcher seeking to improve our understanding of desert ecosystems and new approaches to managing them. The author's passion and expertise show in this outstanding summary of knowledge from his experiences, published research, and the craft of farmers and herders through the millennia." "Within these pages one finds a comprehensive overview of the myriad challenges inherent in arid lands restoration, and also practical approaches, field tested by decades of trial and error, to successfully restore these globally important lands. David Bainbridge has provided an important and informative guide to restoration of fragile desert ecosystems." "Bainbridge brings the desert to life and richly illustrates practical, proven techniques from around the world for healing damaged drylands. This book should find its way into classrooms where principles of applied ecology and ecosystem restoration are taught." "This book provides an all-in-one handbook for restoration ecologists, farmers, ranchers, and others ready to roll up their sleeves and get to work restoring degraded drylands, whether in temperate or tropical environments. It synthesizes practical lessons for restoring ecosystem functions in a dryland landscape, drawing upon diverse methods from time-tested indigenous knowledge to cutting-edge science." 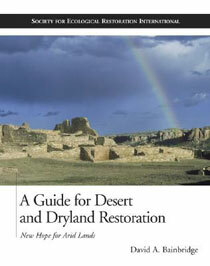 "A Guide for Desert and Dryland Restoration is an excellent source of practical information for restoration and another fine publication from Island Press."